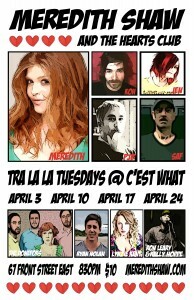 Toronto singer/songwriter Meredith Shaw begins a month-long residency at C'est What tonight. Tra la la Tuesdays as they are dubbed, will see her (and friends) play the venue every Tuesday night during the month of April. Things get underway at 8:30pm tonight. Cover is $10. After April winds up, Shaw will be hitting the road with Big Sugar. Speaking of Big Sugar, she will also be shooting a video for the Gordie Johnson remix of "Acting Badly".